Let yogurt soften slightly at room temperature and spray a muffin tin with cooking spray, wiping the excess off with a paper towel. In a small bowl place about 1/2 cup of the softened yogurt and add desired food coloring. Mix together well. Place half of the yogurt in the bottom of the muffin tin. Layer 1/4 cup of the cereal on top. Add the remaining half of the yogurt on top of the cereal. Top with an additional 1/4 cup of cereal on top. Repeat with the other muffin cups. You may want to put the muffin tin in the freezer in between mixing the yogurt so that it doesn't melt too much. Place finished cups in the freezer for about an hour or until firm. 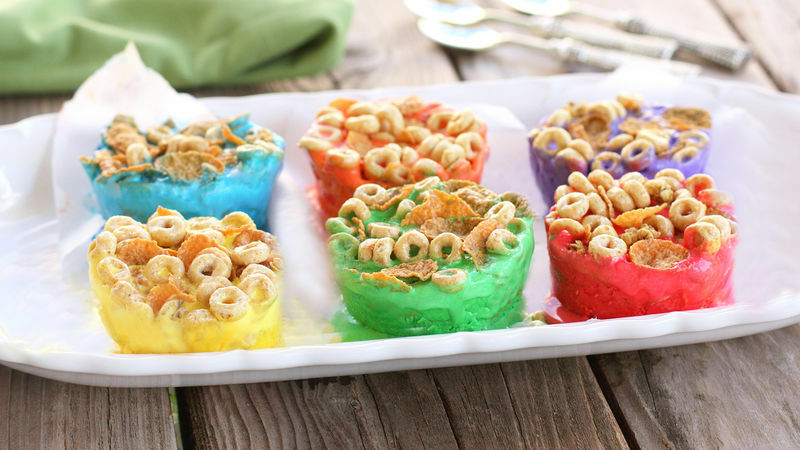 Colorful cups of Greek yogurt sport layers of Honey Nut Cheerios Medley Crunch in this brilliant breakfast statement! Ice cream for breakfast? It might look like ice cream but these Fro-Yo Rainbow Breakfast Cups are actually colorful cups of healthy Greek yogurt layered with Honey Nut Cheerios Medley Crunch. A muffin tin works perfectly for making these easy cups. A bright and fun start to your day. These are great for making ahead and popping out when you need a quick perfectly portioned breakfast. Isn't this a ray of sunshine on a dreary winter day?